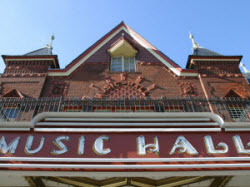 This Music Hall Needs You! The Music Hall recently underwent a $2M restoration project that ensured the structural integrity of our 1885 landmark theater for many decades, replacing old rubble and even wood foundations with reinforced concrete. We also added water drains in the alley behind the theater, which was much more costly and complicated than it sounds, new exit doors, new and repaired slate roofs along with many other improvements. Although the interior is not much changed, walk around the building to see the new surfaces, or watch this clip for some "before and after" action. Would you consider a tax deductible donation to help us rebuild our reserves again, and speed up planning for future projects like accessibility upgrades and restroom expansion?